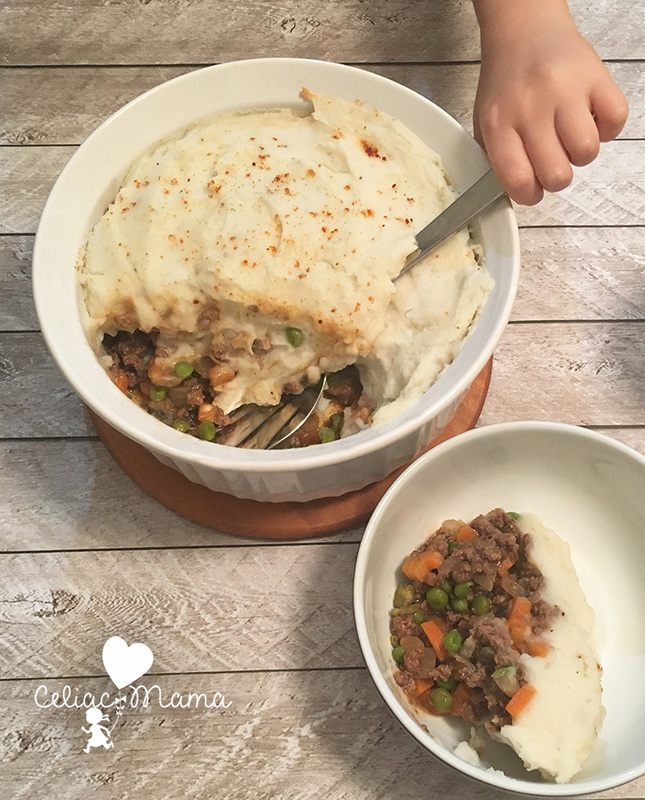 Gluten free, dairy free Shepard’s Pie is a classic Irish dish that is well-suited for the whole family, including your littlest eaters. St. Patrick’s Day is a few weeks away and we really get into celebrating the holiday at our house. In my 20’s, celebrations included enjoying green cocktails and that was about it. While I’m definitely going to make some green smoothies and serve my kids green pancakes for breakfast, I also wanted to come up with a main dish for dinner that the whole family would enjoy. Last year, I made corned beef and cabbage and it was out of this world delicious. This year, I decided to tackle Shepard’s Pie and make it gluten free and dairy free. 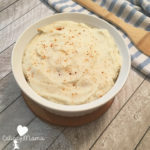 Traditionally, it often includes whole wheat flour as a thickening agent as well as a few ingredients that can contain gluten; plus, the mashed potatoes have tons of dairy. While the recipe below lists quite a few ingredients, it’s not an overwhelming or complicated recipe. It took me 40 minutes to make, which in my world is a little bit too long for a week day but ok for a weekend and definitely ok for a holiday. If you have toddlers, I include a toddler twist at the bottom and a babyfood option too. It also freezes really well, so if you have leftovers that’s another future dinner you won’t have to prepare. This recipe is free from gluten, dairy, eggs, soy, peanuts and tree nuts. Wash, peel and cut the potatoes into cubes. Add the potatoes to a large pot, cover with water and bring to a boil. Cook the potatoes until they are very fork tender. Drain the water and add the salt, pepper, 1 cup coconut milk and olive oil to the pot. Using a hand mixer, blend until the potatoes are creamy. If they need more moisture, add the remaining 1/4 cup of coconut milk and then 1-2 tbsp of coconut milk at a time and blend until your desired consistency. Taste test while blending the potatoes and add salt and pepper if needed. While the potatoes are cooking, chop your onion and carrots and set them aside. Add 1 tbsp of olive oil to a large skillet on your stove top and turn the heat to medium. 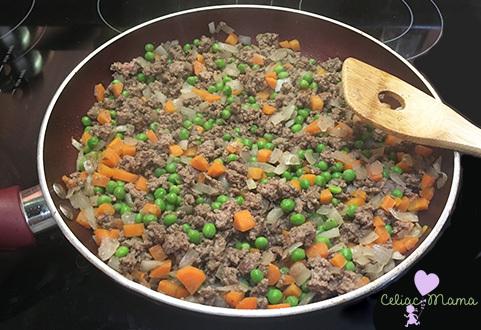 Add the ground bison (or ground beef), onion and carrot to the pan. Cook, stirring often until the onion is translucent and the beef is browned. Add salt, pepper, and brown rice flour and stir often for two minutes. Add the beef broth and peas, and bring to a boil. Add the gf ketchup and cook it for two minutes. Add the beef and vegetable filling to a large corningware or pyrex dish and spread evenly along the bottom. Add the mashed potatoes on top of the filling and spread evenly. Sprinkle the top with paprika. Place the dish in the oven and cook for 5-10 minutes. You want the top be firm and to brown a bit, but you don't want it to burn so keep checking. 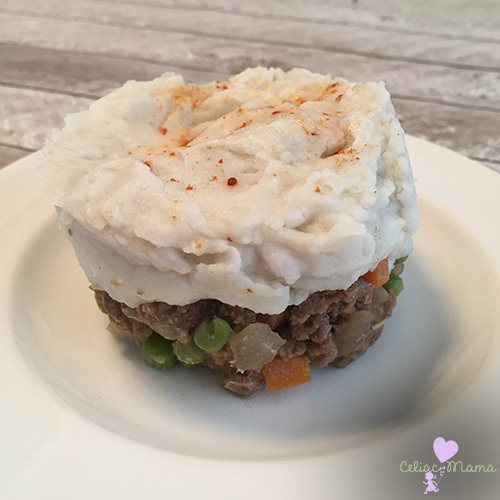 Take out some small ramekins or small pyrex dishes and make several mini shepard’s pies. When you’re ready to serve them, turn them upside down and they come out like a cute tower on the kids plates. They’re also individual servings so you can freeze the extras for later use. If your baby is too little for these textures, then take 1/2 cup and blend it in a food processor and serve, storing the leftovers in the fridge for up to two days.